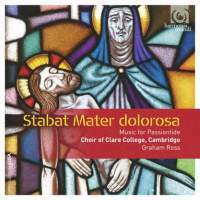 What is open to question is whether this soothing and unruffled sound really suits this programme of assorted Lenten and Passiontide motets and anthems interleaved with plainchant. Music which is both inspired by and descriptive of the most painful and anguished moments in the Christian narrative somehow loses its edge when delivered in such luxuriant comfort. For me, it has the same effect as those soft‑focus, slightly hazy images of candles and choirboys much loved by television producers seeking cloying sentimentality over directness of expression. Music by Byrd, Lassus, Lotti, Tallis and Victoria merge into each other in a flowing stream of seamless melody, a delight to the ear but so undemanding as to be verging on the bland. 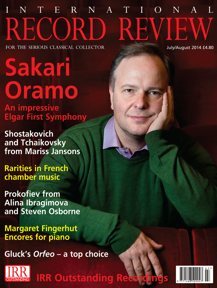 Nevertheless this is a wonderfully mixed bag of a programme, and if the early music suffers under this homogenized approach ‑ a chorale from the St John Passion has all the spiritual impact of an ice‑cream‑van jingle heard through a long tunnel ‑ the Victorian sentimentality of Stainer's God so loved the world is perfectly evoked. Even more suited to this soothing choral sound is Duruflé's atmospheric Ubi caritas et amor, delivered with not a hair out of place, not a blemish in sight, and plenty of restrained emotion to create something which can best be described as vaguely sanctimonious. amount of aural veneer can obscure, and with a choir which does sing with such technical perfection as this, this is a performance which has real impact. Even more impressive is the performance of The Reproaches by John Sanders, a former Gloucester Cathedral organist who certainly knew a thing or two about getting the best from a choir whose sound is often masked by a cloying acoustic. At almost 11 minutes, this is the longest single item in the programme, yet with its seamless movement between dissonant outbursts, smooth, sustained consonant harmonies and lines of unaccompanied plainchant, it is certainly one of the most absorbing. For once the singers are willing to poke their heads over the parapet and give us a taste of what they really can do; it's not exactly unrestrained passion, but one feels it could explode at any moment into a glittering array of choral pyrotechnics. In fact, at the climax of Bruckner's Christusfactus est, that is precisely what happens, Ross keeping his powder "dry right up to the moment when it all bursts out with spine‑tingling impact. Unquestionably the choir reserves its interpretative pinnacles for the two items by Ross himself, Of the two, Precor te, Domine is by far and away the most adventurous musically, inhabiting a world of harsh dissonances, and awkward intervallic leaps, which certainly gives plenty for these singers to sink their teeth into; which they do with unabashed alacrity. The sparse harmonic language of Ut tecum lugeam brings a more raw emotional edge to the programme and, again, provides a splendid showcase for this chair which, left to its own devices, I suspect could really stir up passions.